Tuesday March 20th 1894 There was a heavy rain again this forenoon. Will helped me put up the rest of the window shades and put up the poles for the lace curtains before noon. He spent most of the afternoon looking over the Borland land. I put up the lace curtains and did some fixing around. It was late when we had supper. Wednesday March 21st 1894 It was warm this morning threatening rain. But cleared of. Will trimmed a few trees before going down to Frank Stackmans for a plow. In the afternoon we went to town together. I went over the river awhile. Edith has not been well. I did some errands and we came home in good time. We read all the evening. 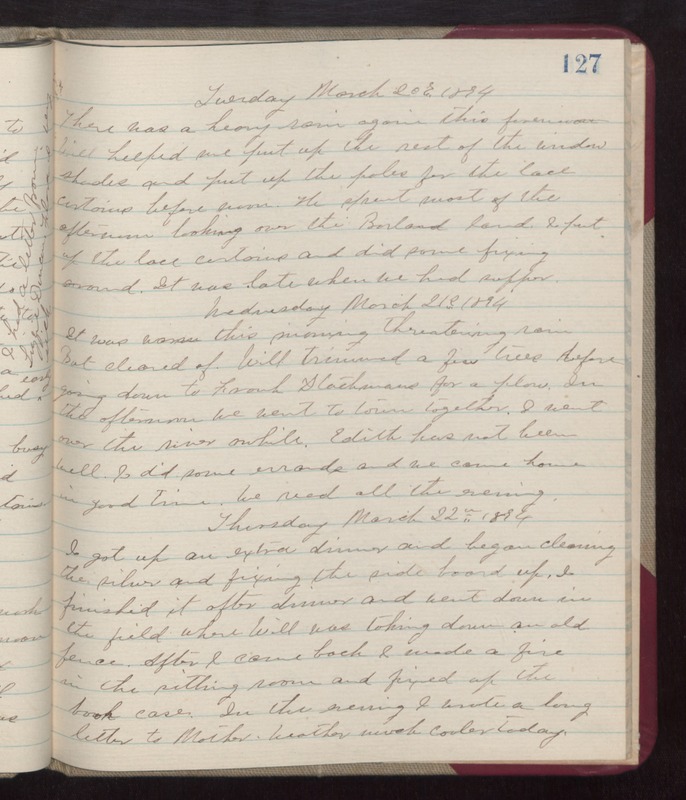 Thursday March 22nd 1894 I got up and extra dinner and began cleaning the silver and fixing the side board up. I finished it after dinner and went down in the field where Will was taking down an old fence. After I came back I made a fire in the sitting room and fixed up the book case. In the evening I wrote a long letter to Mother. weather much cooler today.